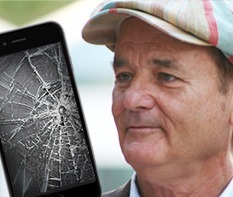 Is your cell phone protected from Bill Murray!?!? If you haven't been paying much attention to the tabloids, then you might have recently missed an interesting development regarding actor and comedian Bill Murray, from Ghostbusters and Caddyshack fame. In case you missed it, on January 11th, Murray visited the Vesuvio Restaurant in Carmel, Calif., where he confronted a few fans trying to sneak pictures of him with their cell phones. It is reported that he grabbed two of the phones and threw them off of the rooftop bar, where they were attending, thus causing heavy damage to both phones. A third phone was also tossed but, luckily, not damaged. As a result of this incident, Murray has reportedly agreed to pay for the damages to the phones. • Roof of your Car: This is one that I am all too familiar with. I was pumping gas at a gas station and taking a look at my iPhone 3G (which really dates this story), needless to say I completely forgot that I had left my phone on the roof of my car and drove 2 miles back to my apartment only for the phone to fall off my car as I was pulling into my complex. To this day, I'm not sure which is more amazing; the fact that my phone didn't fall off during the 2 mile drive or that my screen didn't break. It could have something to do with the 12.3mm thickness of the 3G screen, as opposed to the current iPhone 5s which has a 7.6mm screen thickness, but either way it was remarkable indeed. Experts believe that an unprotected screen could not withstand that type of impact with the newer models of iPhone. • Watching sports: This one is much more geared towards the male demographic, but can really apply to endless circumstances in our daily lives where we overreact. Have you ever been so angry (or excited) that you've thrown something? Well that's the concept here. It's been reported multiple times that there have been plenty of claims for similar reasons. This act has been, fittingly-named a "fit of passion". Alright, now let me bring you back to where this all started, Bill Murray. In all fairness, the frustrations of having your picture snapped everywhere you go can become maddening, I'm sure. 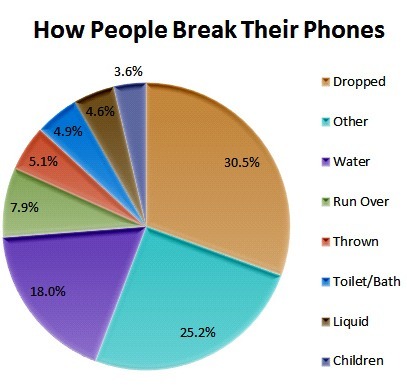 But let's focus on the real victims here... the cell phones. Just the thought of witnessing your phone being hurled from a second story bar is enough to make anyone cringe. But picture yourself watching that same fall in slow motion, seeing your life flash before your very eyes, and then you realize that your phone isn't insured! Okay, take a deep breath now... it was just a nightmare. But how can you prevent that nightmare from becoming a reality? It's easy... insurance coverage! If you are ready for some peace of mind, then make the move today! Learn more about purchasing a policy and receiving a quote on your cell phone here.